Easter is quite an event in my family and when it happens in April it becomes really complicated. As an Orthodox Christian, I usually celebrate Easter a week later than most. My “name day” falls on Palm Sunday and when you add my daughter’s name day, my birthday and my wedding anniversary, it gets really messy. All those holidays require a lot of planning, cooking and my favorite – baking. I usually go through several pounds of flour, huge amounts of butter and eggs – and I love it. This year we had two full-blown Easters, including two rounds of egg coloring, a traditional Polish Easter breakfast, an American egg hunt and – a week later, as the Bulgarian tradition requires – roast leg of lamb, stuffed with rice and fresh herbs. I was in charge of the kozunak – the Bulgarian cousin of Jewish challah bread and French brioche. 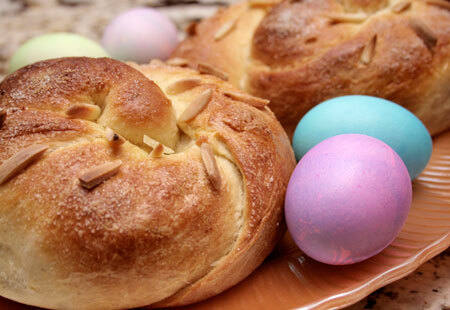 Though in Bulgaria you can buy it all year round, the Easter one is special and no celebration is complete without this sweet bread, heavy on the eggs and butter, and stuffed with dried fruits and nuts. The butter-vanilla-lemon zest aroma of the kozunak is one that defines this holiday for me, as are the blanched almonds that decorate its top and the eggs done up in psychedelic colors by my kids. The recipe I have used for more than ten years now is from a cookbook first published in the thirties, which belonged to my grandmother. At first I was quite afraid, as the description and ingredients were very vague, but I was stubborn and wanted to feel that Easter aroma even if there were no almond trees blooming outside our Warsaw apartment. The first year the breads were flat and a little dry, but we ate them anyway. Besides, nobody knew the real thing except me and that was an advantage in my favor. I was expecting to engage in serious combat with the dough, as I’d heard legends about how hard it is to knead and how long it has to be worked on. To my surprise it was actually easy, and as good a stress reliever as any bread dough. The recipe is for one kilo of flour and this may put some people off, but it’s worth making the whole amount. You can use different stuffings, make one plain and toast it for breakfast like brioche or freeze the extra dough for croissant-shaped rolls for weekend brunches to come. Sift the flour in a big mixing bowl and make a well in the middle. Crumble the fresh yeast, or pour in the dry, into a small bowl with 1/2 cup warm milk, add 1 tbsp sugar and enough flour to make a thin batter. Cover and leave in a warm place until it starts bubbling – about 10-15 minutes depending of the air conditions. Keep an eye on it, as it tends to explode! Whisk the eggs with the sugar and add the rest of the warm milk, zest, vanilla and rum. When the yeast is ready, add it to the flour, than the egg mixture and 1/2 tsp salt. Start making the dough adding the melted butter little by little or dipping your hands in it (that’s how I do it) and working the dough until all the butter is incorporated. When kneading the dough instead of pushing, pull and stretch it on the side of the bowl and then roll it into a ball and stretch again until it’s smooth, doesn’t stick to the walls of the bowl and little bubbles appear on the surface. Add some extra flour while kneading if the dough is too sticky. Form a ball, place it in a buttered bowl, cover with a clean tea towel and put in a warm, draft free place to rise – until double its size (around 1 hour). Or place it on a floured wooden board and cover with a big glass bowl like for the pizza dough. Preheat the oven to 375°F (200°C). The amount is enough for several loaves depending on the sheets and pans you are going to use. Pull three equal dough balls, roll them into logs on a buttered surface and make a braid, place on a baking sheet or cake pan lined with parchment. Leave it to rise again covered with a clean moistened towel. When it doubles in size, brush with the egg wash, push some almonds into the top and sprinkle with sugar. Bake until golden brown and a tester comes out clean – 20-30 minutes. Take out before it has cooled completely. Kozunak can be stored in an airtight container, but is best eaten fast. You can also make a roll with the dough. Roll 1/3 of the dough into a square around 1cm (half inch) thick. Mix one jar of jam of your liking (mine is fig) with handful of chopped walnuts and the same amount of raisins, dried cranberries or cherries, and spread over the dough, leaving 1cm free on the edges. Roll it and place into a cake form to rise. Brush with the egg wash, place almonds and sprinkle with sugar, then bake as before. You can make little croissants, either plane or with sweet stuffing like for the roll. After shaping them, place on a baking sheet, leave to rise and do as before (skip the almonds). Or you can stuff them with a mix of ½ pound crumbled feta and one big egg for about ¼ of the dough. Those are the ones my kids fight for – often with me. Condiments are as essential for a good sandwich as good bread is, at least for me. I can’t stand a boring assembly and would rather spend half an hour sauteing and marinating ingredients than getting a quick fix of ham and cheese. To avoid dropping from hunger in the meantime, I always have a few essential condiments in the fridge to add zing to the experience. I make most of them myself, as I’m too picky and besides, it’s more fun and cheaper than buying ready made. 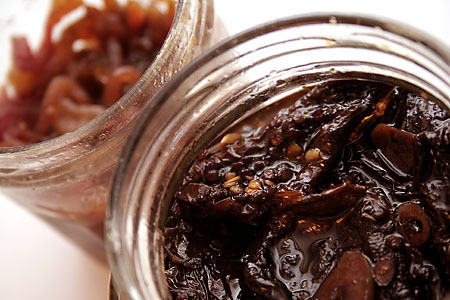 The two that for me are must-haves are sun dried tomatoes and caramelized red onions. I have serious competition for the first one – my daughter, who devours them straight from the jar. She also helps me make them and keeps track of the supplies, pushing the alarm button when we are left with only half a jar. I use $3,99 500-gram packages of Turkish dry tomatoes without oil from a Lebanese store on Kedzie and Lawrence, which I marinate and keep in the pantry. It’s enough for three 12oz jars packed tight to the top. It’s much cheaper than buying them ready made and I can control the ingredients. I use them for pasta, salads, antipasti, grilled meats, dumpling stuffing – the possibilities are endless. Never throw the marinade away – it makes a great base for vinaigrettes or adding extra flavor to simple tomato soup or roasted potatoes. The onions are my guilty pleasure – I can go though a jar in a single day, eating them with absolutely anything – including pancakes. I takes all my willpower to screw the top back on and put the jar aside. The recipe is very basic and anyone can make them. Both condiments will make a delicious and sophisticated dish out of any boring sandwich, burger or cheese plate, if you care about impressing your guests or family. I simply like to indulge myself and anybody else brave enough to follow suit. Fill a soup pot a third full with water and bring to boil. If the tomatoes are salty (like the Turkish ones I use) don’t add salt to the water, if not – add I tbsp salt. When boiling, add the tomatoes and bring back to boil for 2-3 minuets. This will soften the tomatoes. Meanwhile in a big mixing bowl combine the rest of the ingredients and whisk well. With a slotted spoon take out the tomatoes and place them into the bowl. Stir them around in the marinade to coat well. Leave for 5 minutes, turning occasionally. Spoon the tomatoes into the jars, dividing the remaining marinade among them. Add extra olive oil to cover the top and close tight. Keep in a cool place, and after opening in the fridge. Best after 2-3 days if you can restrain yourself. Heat the olive oil in a heavy-bottomed frying pan over low heat. Saute the onions for 15-20 minutes or until soft, stirring occasionally. Add the vinegar, sugar, salt and pepper and cook for another 2-3 minutes or until caramelized. Spoon still warm into the jar and close tight. Keep in a cool place, and in the fridge after opening.